Recently it was announced that the First Lady Michelle Obama's poll numbers are on the rise, to 68%. But some, like Salon.com's Kate Harding, say the First Lady owes her new favorability to her dumbed-down image. The author takes issue with Harding's analysis and explores the deeper meaning of First Lady Michelle Obama's role. Lately, I’ve been reading about how some folks have become disgruntled with First Lady Michelle Obama’s high poll numbers. They attribute her new favorability to what they refer to as her “toned down” image–from high-powered Ivy League lawyer to “Mom in Chief.” They want her to flex her political muscle in White House politics; proving her Ivy League pedigree at every turn. She should become more outspoken, like Hillary Clinton during her husband’s presidency, for example. As a Black woman, mother, wife and academic, I have watched Michelle Obama’s ascent into pop culture stardom. Disliked because of her “perceived” lack of American patriotism during the presidential campaign, she has now become a household name, as popular as Michael Jackson and Elmo combined. But to me, she is becoming one of the most radical women of our time. Before the winter frost cleared away on the White House lawn, the first lady, with her crew of local D.C. 5th graders and White House staff, broke ground and created the White House Garden. With that act, she initiated a new consciousness and a (subversive) fight against the food and pharmaceutical industries by educating American children, especially our children of color, on how to create a sustainable, healthy life beyond sugar, soda and packaged food in the supermarket. Coupled with the fact that the average American kid does not know the origins of a banana and the greenest thing on their plates are green M&M’s, Michelle Obama has now given our children – our future – the real tools on how to nourish themselves and possibly save this planet. 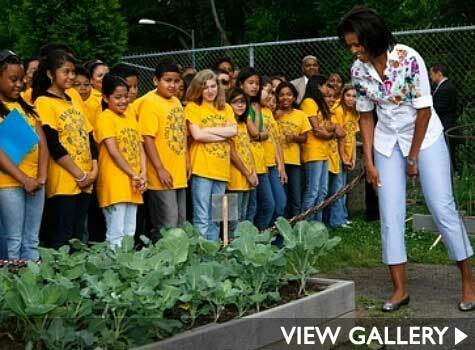 Slipping in under the radar as a woman who just teaches kids to eat their vegetables, Michelle Obama is making radical connections with children that our problematic public education system has been striving to for years. She is doing the most poignant and timely work right in the public eye and touching those who need to be most affected. But most folks cannot foresee the legacy of her work nor the impact it has on children and communities of color. This is one brave woman. But some feminists cry that she is too domestic, too much of a fashionista. Yet, her presence on “Sesame Street” has more impact than if she lectured on the war in Afghanistan. Why? Because she is teaching historically underserved and invisible public school children (and their parents, siblings and future generations) where real food actually comes from – that lettuce comes from a seed, that tomatoes grow on vines – that the food we eat has a direct impact on our health. Silently, with her beguiling smile, Michelle Obama’s agenda is to fashion generations of children as soldiers in a war with the big industries that profit from our ailing bodies. Facing a history where African Americans have done everything in their power to move away from the field into industrial society because of the ruinous memory of slavery and sharecropping (and rightfully so), Michelle Obama braved the idea of disrupting the “New Black Woman” image (suited, wealthy, educated, coiffed) and embraced the earth, planting, according to White House reports, over 50 types of vegetables. With each cabbage and every drop of water, Michelle Obama has told our children that it is okay to be alive, to be healthy and non-medicated; that we can move beyond hating our bodies and finally nourish ourselves. Natasha Gordon-Chipembere is an Assistant Professor of English at Medgar Evers College, CUNY. She is currently co-authoring a memoir with Malawian activist, Catherine Chipembere and editing a collection on Sarah Baartman.